As families travel to the beach this summer, there’s a brand new must-have for sun protection. 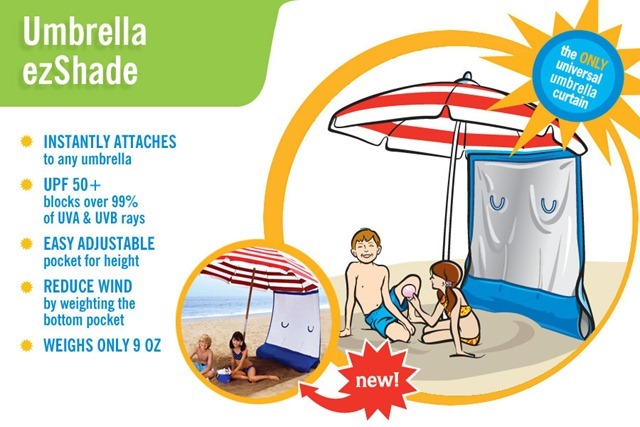 The ezShade is the new portable shade curtain that instantly attaches to any umbrella or canopy – giving more sun protection in a wider shaded space, without having to tote around a heavy tent. 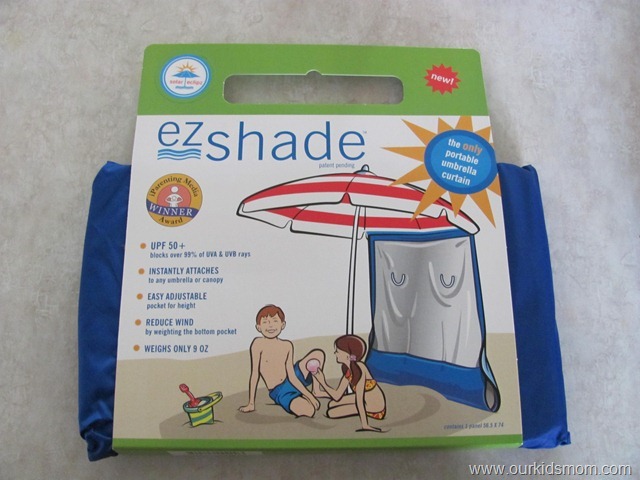 ezShade is also UPF 50+ and blocks over 99% of UVA and UVB rays. As a soccer mom, I am constantly chasing the shade and trying to keep my little guys from getting a sun burn. With the ezShade, you take the velcro straps and set them to the appropriate spots on your beach umbrella… let it sit several minutes and you are ready to go. Set your umbrella up as usual and use the ezShade to block the sun coming in. There are pockets at the bottom to use with weights (keep it from flapping in the wind). You can use the sand when on the beach, towels, stuff from your diaper bag, shoes… whatever works. 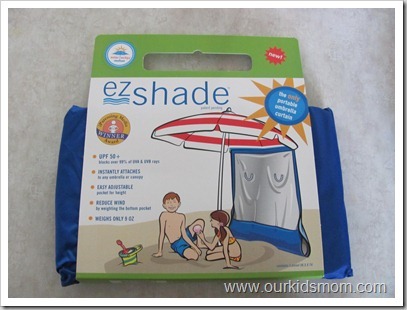 ONE OurKidsMom reader is going to win an ezShade (umbrella version)! * Check out ezShade’s website and tell me something you like, learned or want. I’ve never even heard of these. What a great product! I learned how easy it is to set up and take down. it has UVA and UVB protection, is lightweight, colorful, and portable. I like their canopy curtain as well. I follow you both on twitter + tweeted. I learned that it came for a canopy as well as an umbrella. I like that it weights only 9 oz. Very easy to transport anywhere. I liked ezShade on facebook. I entered the Wire Fire giveaway. I just finished looking at photos of the ezShade umbrella and did not realize how portable it really is. It folds down to the compact size of a small umbrella… and it appears to come with its own carrying bag. Thanks Heather! I would also want the straight leg 8ft canopy ezshade! i love that it blocks 99% of all uv rays!! thats great! checked out the site and would love to have a 12′ Straight Leg Canopy Curtain! also like EZShade on facebook – Theresa A.
I love the straight leg canopy curtain. I LOVE this concept because of my fair skin!!!!!!!!!! I learned that it only weighs 9 oz. that is great ! I like the straight leg canopy ezshade also. I would love to win this for my week old granddaughter and we live close to the beach this would be an awesome win for our summer. Invented by a mom (naturally) who needed shade for those endless sports practices. I want this shade! Never seen one before. Visited website, and I learned that Linda M. Varga invented the product. I entered the Thomspon’s water seal and deck wash giveaway. I learned EZShade comes with a matching tote for storage and transport. Thanks! entered your oh sew lucky designs giveaway! thank you for another wonderful giveaway! i love the fact that it weighs only 9 ounces! that means that a lightweight like me can even put one up instead of having to wait for one of the muscle bound types to do it for me! i follow you and ezshade on twitter @ntiveheart and tweeted! The Umbrella Curtain would be great to take with us when we go to San Diego next month. Very cool. Follow both as @lewalk76 on Twitter and tweeted. I really like the umbrella since I love the sun but hate getting burned so the SPF 50+ it provides would help! I like the 12 ft. canopy shade. I really like how small it folds up to! You can customize the shade with your corporate or club logos. Pretty cool. I really like the 12′ straight edge canopy shade. Very nice and another product I would love to own. 🙂 Thank you. The straight leg 12ft canopy ezshade.